The Hog-Nosed Skunks belong to the genus Conepatus and are members of the family Mephitidae (skunks). They are native to the Americas. They have white backs and tails and black underparts. 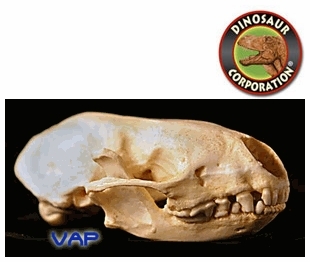 Hog-Nosed Skunk skull replica is cast from original specimen. Areas: The wooded areas of Southern Colorado to Argentina. * Hog-Nosed skunk Skull museum quality replica is cast in durable Polyurethane resins.